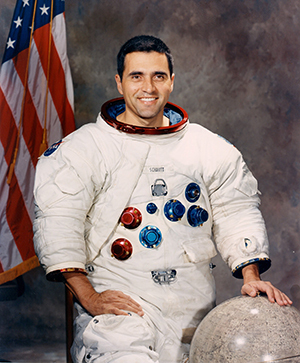 In 1972, Jack Schmitt walked on the moon. In 2013, Payton Miller walked on the UT campus and a year later began her unofficial career painting the Rock. Their worlds collided with a simple handshake May 13 during the College of Arts and Sciences 2017 commencement ceremonies. More than 900 graduates joined Miller and walked across the stage in the Thompson-Boling Arena, shaking hands with Dean Lee, Chancellor Davenport, and Astronaut Jack Schmitt, who received an honorary Doctor of Science and Humane Letters degree from the college. Schmitt addressed the graduating class and shared his experiences as an astronaut, telling graduates that his years with the Apollo program taught him that we as a country rely on young Americans to do great things. Learn more about his advice to graduates. Schmitt’s ties to UT stem from his relationship with Larry Taylor, professor of petrology and geochemistry in the Department of Earth and Planetary Sciences. In 1972, Taylor was in the “backroom” of the Johnson Space Center during the Apollo 17 Mission advising astronauts on the moon, which included Schmitt. Taylor, who considers himself a true “lunatic” because of his continuous study of and fascination with lunar rocks and soil, started his distinguished career at UT in 1973. His outstanding service to the college and university over the years earned him the 2017 College Marshal Award, the highest honor in the college. Read more about this honor and Professor Taylor’s career. As the unofficial painter of the Rock, Miller spent many long nights creating images of UT icons such as Smokey and Pat Summitt. Thirty paintings later, she graduated as a member of the Chancellor’s Honors Program with a degree in biochemistry. Learn more about her journey.